Utilizes on 1 foot of Row Space!! Introducing the New Standard in High Density Cooling. It changes all the rules. This sets a new Paradigm for cooling in Data Centers. This meant that a traditional “10 ton” unit could cool approximately 35 KW (if the airflow permitted) and needed 50 sq ft of floor space. They were usually located at the outside edges of the room and used a raised floor to distribute cool air where it was needed. With today’s high-density heat loads at 5-15KW per rack=100-300W/sq. ft. (and rising) this traditional cooling methodology simply does not work for high-density applications. In-Row is the new standard in High Density Cooling. It changes all the rules. Rated at up to 30KW ( ~8.5 tons/105,000 BTUs) it is only 12” wide by 42” deep. (3 ½ sq. ft.) This unit fits directly into existing rows of cabinets, occupying only ½ rack of row space and does not require any additional side clearance space. This new groundbreaking design has multiple benefits. The closer to the heat generation source the air conditioner is, the less likely mixing of hot and cold air streams will occur. 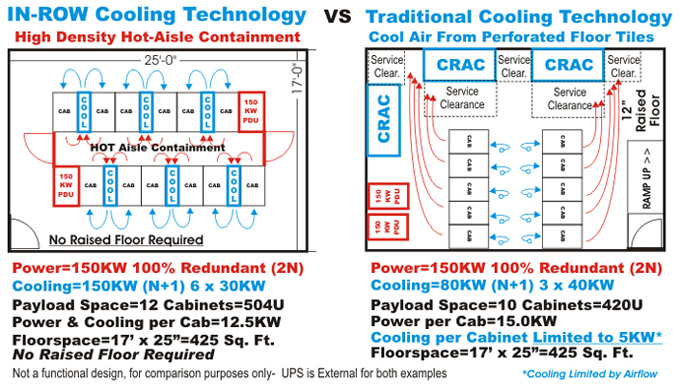 The In-Row Cooling unit is a computer room air conditioning system with a horizontal airflow pattern specifically designed for hot aisle/cold aisle configurations. 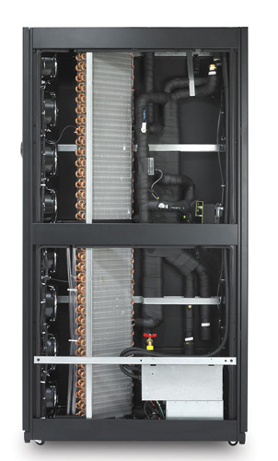 Warm exhaust air is drawn directly from the hot aisle, cooled, and distributed into the cold aisle, ensuring that equipment inlet temperatures are constant and adequate for proper operation. Closely coupling the air conditioner with the heat source produces a more efficient direct return air path to the system. Use one In-Row unit to solve a Hot-Spot or let NAAT design a complete power and cooling solution for your organization’s Data Centers using the cooling distribution unit which supports up to 12 In-Row cooling Units. 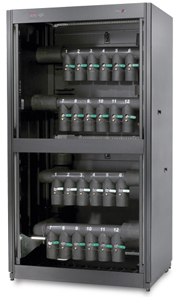 The Chilled Water Distribution Unit (sort of Chilled Water version of a PDU) supports up to 12 of the 30KW In-Row units. It uses flexible piping to connect to the In-Row unit, so that it once it is installed, you can add the In-Row units at any time, without hard piping any chilled water, or disrupting data center operations. In effect, you can just keep rolling in more In-Rows (they have wheels) and just plug in and run the flexible hose to add more cooling where and when you need it.